I stood before the class on Wednesday morning, wondering how I would make it through, wondering how all my assumptions and beliefs had been so wrong. I am a scholar and a teacher of the American political system and throughout my career, I’ve always had faith in the fundamentals of democracy. I was sure that most citizens, when given a choice, would make compassionate, responsible and informed decisions rather than merely selfish ones. The sea of student faces stared at me, some openly hostile, some tearful, others just curious over whether I would break down. I was curious too. I ignored my headache and queasy stomach, and spoke. Brian, the student who always sat in the front row with his Make America Great Again baseball hat perched victoriously upon his head, scoffed. He was the one who had filmed my speech, which the dean had declared “too partisan.” After I’d refused to apologize, the dean had accepted my resignation. Yet I quickly regretted my choice, so my cousin Robin, who knows a few things about PR, helped me contact the media to get my story out. The school didn’t want negative attention, so they recognized my request, and let me make amends and return. But I’d never really believed that Donald Trump would surprise the nation and win, or that my return would be on the morning after his horrifying victory. I hadn’t slept and my eyes still stung from all my tears. I’d been unable to stomach breakfast and was literally running on empty. Now Brian leaned forward in his seat, ready to pounce on whatever I might say. There were a few more laughs, but also some gasps. I let my eyes scan the room and found enough silent support that I could continue. The room was silent. For once Brian didn’t have anything to say, though the scorn in his squinting eyes and puckered lips spoke loud and clear. After class, I went home and collapsed on the couch. All my adrenaline had drained way, and I was shaking from fatigue and raw emotion. I didn’t think I’d be able to nap, but I was too spent to try and do anything else. I must have drifted off, because an hour or so later I was woken by a hand softly brushing my cheek. I blinked my eyes open, not trusting that the face I saw looming over mine was really there. He was supposed to be in DC through Thursday. We’d argued about it. Several days ago, I’d called and laid it on the line: I loved him, but was crazy jealous over his devotion to his ex-girlfriend/co-worker, Evelyn. We’d talked it all through, but while I believed that he wasn’t having a physical affair, I wasn’t so sure that he wasn’t having an emotional one. “You’re not going to be home for election night?” I’d said. “That’s supposed to be our night. How can we not spend it together?” Eight years ago, when Obama won the presidency, Monty had proposed. That had been the best night ever. But the words had felt vast empty, and that night, our bed had felt vast and empty too. Now, as I laid on our cozy little couch, he was close enough to touch. Yet I didn’t trust my senses. “How’d you get here?” I asked. His gaze was deep and penetrating, profound enough to stop my shaking. I answered him with a kiss and his mouth responded to mine with passion. One hand pressed me to him, while his other hand caressed the back of my neck before he plunged his fingers into my hair. Our bodies intertwined. But more than that, on this most heartbreaking of days, we found the potential for healing in each other. No doubt that there were dark days ahead, but a glimmer of hope still shone through, the notion that when you least expect it, love can still trump hate. Friday night I watched Poldark with Monty’s cousin, Robin, thinking that if nothing else, the eye candy of the moors in Cornwall and Aidan Turner’s abs would be a pleasant diversion. But early in the episode I knew that my plan was foiled, when Poldark’s cousin, Verity, asked Demelza (Poldark’s wife) if she was jealous of the attention Poldark was paying to his ex-girlfriend, Elizabeth. Demelza said no, that marriage is like church, and if you don’t have faith, what’s the point? Absently, I ran my fingers through my hair and they caught on the curls. What I didn’t say was that I was almost glad to see him go, almost glad to have some space to figure things out. “Let’s keep watching.” I pointed the remote toward the TV and pressed play. Would Poldark be forced into debtor’s prison on the day after Christmas? Would he ever notice poor, suffering Demelza again? Robin settled in, clearly enthralled with the story, but I barely paid attention. My mind still swam in my own personal drama, and I replayed much of what had happened in the last few days. After I’d spoken my mind about the ugliness of the Trump campaign to all my students, Dean Hughes said I could only keep my job if I apologized to the class, and especially to Brian, the student who told me I was a pathetic liar that deserved to be “gotten” by the riots that would surely happen if the “rigged system” elected Clinton. I exited his office with a sinking heart and went to pack up my own office, fighting tears all the while. I would miss this job. Of course, I wondered whether I was doing the right thing. Maybe I was crazy to throw away my career over a few lousy ideals. I worried about setting an example for my students, but why kind of example would my quitting set? Maybe I could figure out a way to word my apology so I basically said sorry, not sorry – and wouldn’t that be better than leaving? What I wanted was to run home and bury my face into Monty’s shoulder, to make him sit and listen while I voiced all my anxiety and posed all my questions. And after all that, I’d ask him what he thought: had I done the right thing? Besides being my husband he was also my best friend. Nobody’s opinion was more valuable to me than his. But once I walked through our front door and found him in his home office, hanging up the phone and rubbing his eyes in the same way that Dean Hughes had, I knew I wasn’t going to get what I wanted. The vertical crease between Monty's eyebrows, the clench of his jaw, and the slight flush to his cheeks told me that bad news was coming. I waited for probably thirty seconds. “That’s all you’re going to say? ‘Okay?’ That’s it?” I kept my voice soft, trying to contain the panic that had been clawing its way out since I had handed in my resignation. “My salary wasn’t that great,” I replied, “and maybe I can find something better.” This was beside the point right now, but I felt obligated to say it. Evelyn, Monty’s ex and co-worker, suffers from AIDS. I supposed that puts her at a higher risk for liver disease. It also puts me at a higher risk for having a husband who will run off without warning to help his ex-girlfriend. Now I focused back on the TV, on the episode of Poldark, which had reached its final moments. (Spoiler alert) Poldark HAD finally realized he was neglecting Demelza, and right before the credits rolled, he promised her his love as they came together in a passionate embrace. Then we talked for hours without coming to any definitive conclusions. 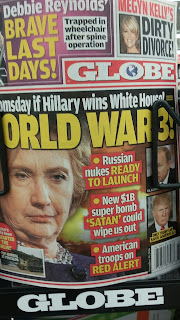 Yet this morning, while the kids were at swimming class, I stood in line at the grocery store and saw the Globe headlines- Doomsday if Hillary Wins the White House! World War 3! Donald Trump is the only one who can save us! Do people believe this stuff? 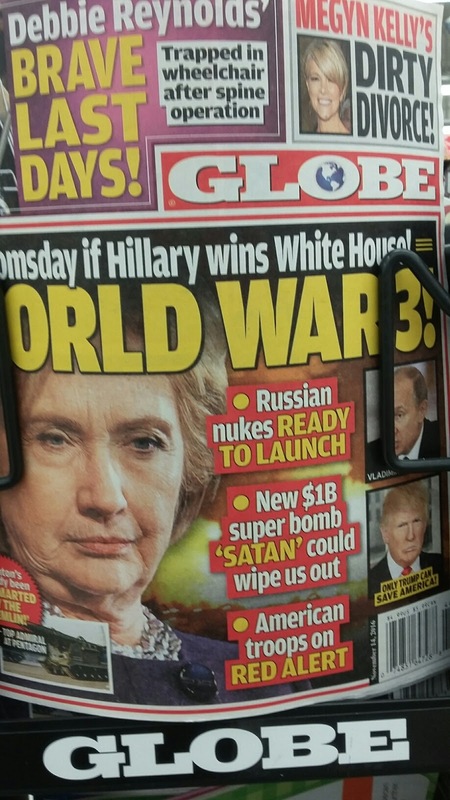 I suppose they must; just like I feel the apocalypse will be looming if Trump wins, other are convinced that a Hillary win will signal the end of days. But I’m not ready to sacrifice all that’s important, and even if I don’t understand faith, I must learn how to fight. I took out my phone and took a picture of the Globe cover. It would serve as a reminder for everything that’s at stake. Can I still take you up on your offer?